As a society, we are increasingly aware of the choices we make towards healthy lifestyles. From watching what we eat, to what we wear and what we’re putting on our hair and skin. While you shouldn’t have to waiver with your lifestyle choices, you also shouldn’t have to sacrifice your hair. 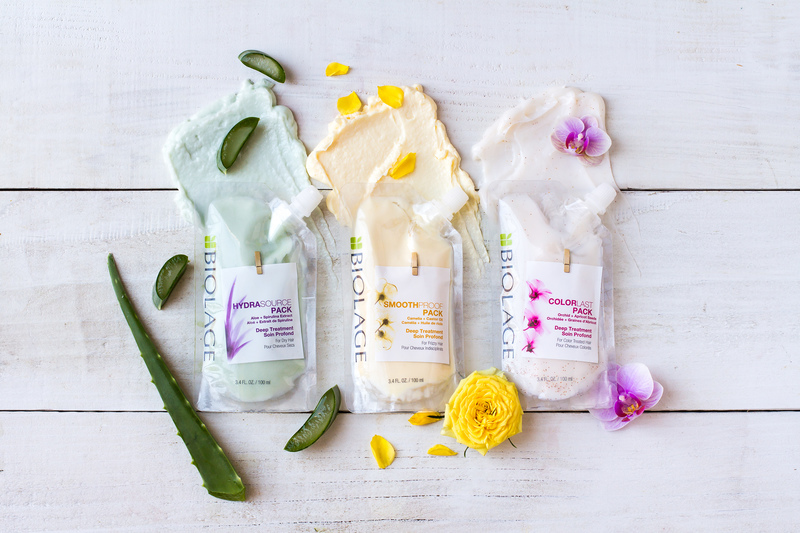 Making it easier than ever, Biolage has created three new vegan treats for your hair! After the long, long winter your hair deserves a little TLC, and with the new Biolage Deep Treatment Packs, stylists and clients alike will be able to transform dry, frizzy hair into a moisturized mane. These treatment packs are highly concentrated with caring agents and ingredients that check all the boxes for great hair and vegan focused choices. They instantly transform dry, frizzy and color-treated hair with a deep treatment for healthier feeling hair with each use. * In keeping with the brand belief that all Biolage products should be good for you, good for your hair and good for the planet, these new treatments use a new packaging design that contains less plastic than traditional hair care products. Vegan and environmentally conscious? That’s a win-win for everyone! We started with what you love the most. 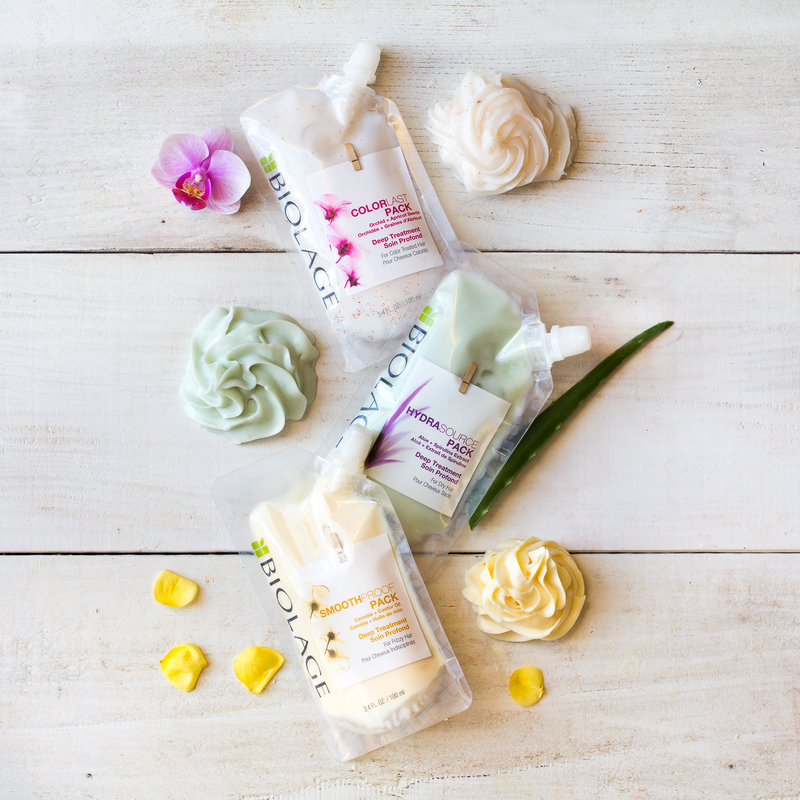 Created from the three most beloved Biolage collections these NEW Vegan Biolage Deep Treatment Packs are an extension of just that! 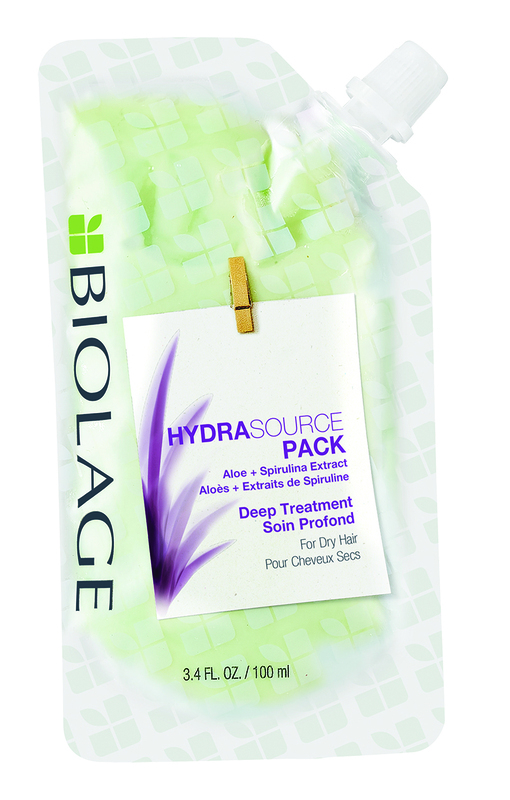 Biolage HydraSource Deep Treatment Pack. This glorious pack Infuses dry hair with moisture and nourishment. You’ll notice instantly that hair is 2X more nourished with up to 70% less breakage. ** What we love most about it? Hair feels softer, more manageable and looks and feels healthier. It’s also packed with aloe and spirulina, which are known for strengthening hair and giving it a glossy sheen. 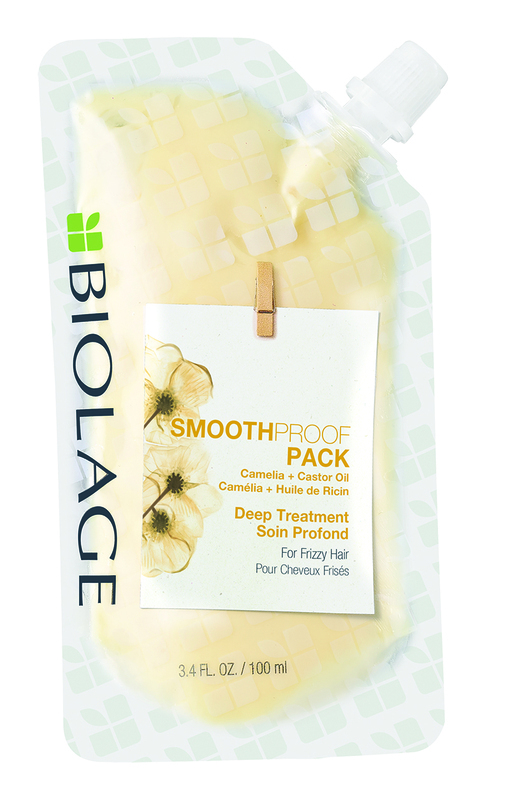 Biolage SmoothProof Deep Treatment Pack. You’ll be able to put frizz on notice with this high-powered treatment. Immediately, hair is 8x smoother with up to 70% less breakage**. What’s even better? Frizz is controlled, and hair feels softer and more manageable for smooth, polished hairstyling results. The goodness of camellia and castor oil strengthen, condition and encourage hair growth while you flaunt your flawless style! 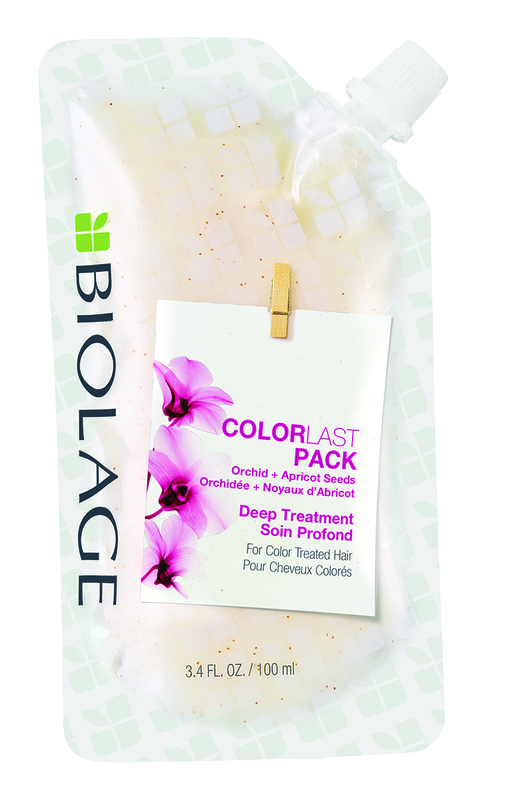 Biolage ColorLast Deep Treatment Pack. No more cold-water rinses or skipping shampoos to stretch out color vibrancy. Show of hands, who’s been there? After using this treatment, you’ll immediately notice that hair is 3X stronger with up to 70% less breakage**. Even better, it prevents damaged, tangled ends and dull, faded color. It works with orchid and apricot seeds to help color-treated hair retain moisture and strengthen hair follicles. These new formulas are Biolage’s highest performing treatments ever, providing instant gratification and total hair transformation. Also, each Biolage Deep Treatment Pack features an irresistible new Biolage fragrance with top, middle and bottom notes inspired by nature. The unique new packaging transforms the user’s experience. These small but mighty packs contain at least four applications. They’re easy to squeeze and perfectly sealed for a fresh application each time. The packaging is 77% lighter than a container of the same size and 55% lighter than a tube of the same size. With the resealable packs, clients can indulge in the first treatment in the salon, then take the rest home for ongoing, high-level hair health maintenance. Highly concentrated in plant-based emollients, these Vegan formulas are bound to be a new favorite for everyone! Biolage Deep Treatment Packs will be available in fine salons and Ulta in March 2019. *Please note when used as a system with Biolage shampoo. ** When compared to non-conditioning shampoo with the system of Shampoo and Mask. For more updates, product releases and more from Matrix be sure to sign up for our newsletter HERE!